The Savior said to hunger and thirst after righteousness. “Walk in My Ways and be perfect”, says Yahweh. At The House of Yahweh, the desire for righteousness is at the heart of every sermon. Future Priest Buffalo Bill was our first speaker and his topic was Pentecost. Reading from the Law, Bill taught how to keep this Feast Day, including the Omer count. He explained that many consider Pentecost the least of the Feasts but he reminded us that this Feast is very important for Yahweh’s people. He read from Daniyl’s prophecies detailing the work of the Last Day’s Witness and Yahweh’s promise for the righteous, those who faithfully attend His Feasts and Sabbaths. We rejoiced greatly in this message and seeing young Buffalo Bill’s eagerness to teach. Our second speaker was Future Priest Deacon Abishalom. He chose a topic that is a growing problem in society – drug and alcohol abuse. He gave statistics revealing the extent of the problem, and then drew our attention to the Scriptures and the instruction written for all. Reading from Ephesians, Thessalonians, and Romans, Deacon Abishalom pointed out how we should be conducting ourselves, at all times. He reminded us that Pastor Yisrayl has provided the tools to build our character. He showed the free booklet on this subject and the Self-Control Unit of the Peaceful Solution Character Education Program. Anyone interested can locate information at www.peacefulsolution.org. Great Deacon David, as third speaker, began with a quote from a man he met at a recent meeting, “In retrospect, we need universal morals that do not separate; morals that everyone can agree with.” This drew a round of applause for the Peaceful Solution Character Education Program, as the Deacon read an excerpt from its introductory page which matched the quote perfectly. 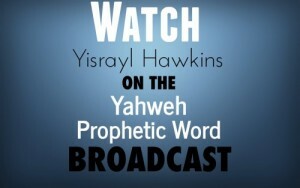 He continued with supporting scriptures from The Book of Yahweh and teachings of Yisrayl Hawkins from the 90s – words forever recorded in the The Second Book of Yisrayl, Going on to Perfection. Timely words, as important now as they were then; and he encouraged us to re-visit these older sermons in order to develop the kind of character traits that are akin to our High Priest, Yahshua. Next, we heard from Great Kohan Benyamin. The Kohan quickly got our mental wheels turning with his title, “Get a Grip” – the topic, Law #6: Hold Fast to Yahweh. He reminded us from Deuteronomy 30 that we all have a choice – choose life (The Tree of Life, The House of Yahweh, the 613 Laws) or choose death (The Tree of Good and Evil, the gods, The Catholic Church). He gave us an example from II Kings of a righteous man who kept Yahweh’s Laws and Yahweh was with him. Kohan Benyamin also gave references from II Timothy, I Thessalonians, and a quote from The Second Book of Yisrayl, Going on to Perfection, Children’s Version – “Be determined to do exactly what Yahweh says!” He brought us back to that bulldog; it symbolically reminds us to “get a grip and hold on” to this teaching and never let it go. The Kohan also showed a picture of the “Horsehead Nebula,” proving the awesome power of Yahweh for this time period. Great Kohan Yliyah gave the news update. He reminded us of Yisrayl’s ability to foretell events as prophecy states. Yisrayl told us that Russia and China would join in the last days… sure enough, recent events have seen that prophecy come to pass. This past week, Russia and China signed a $400B gas agreement. Kohan Yliyah presented other events: E. coli found in ground beef sparking warnings and a huge recall, boil water advisories, the shocking molecular structure of the fake sugar aspartame (a real eye-opener), and more warnings about global warming, all pointing to the times Yahshua said would be the worst in man’s history. Our sixth speaker was our beloved Pastor Yisrayl Hawkins. The Last Days’ Witness began his sermon by stating that we are in “the last part of the last prophesied present generation,” noting the growing interest for the House of Yahweh and Yisrayl Hawkins by the numbers of online papers carrying our press releases. He told us that over 50 years ago, JG and Bill Hawkins (The Two Witnesses) began their first broadcast in Eastland, TX. Pastor stated that many who attended the first Sanctuary came by way of having tuned in to that radio program, called “Opposing Babylon.” Fifty-two years later, Yisrayl Hawkins continues to oppose Babylon. Pastor drew our attention to Isayah 59:1-2 and explained why prayers are not answered. With many posting signs to “pray for rain” (including the churches), Yisrayl adamantly stated, “Only Yahweh can answer prayers.” He pointed out that sin, the breaking of Yahweh’s Law, is the cause for all the problems – including global warming, deadly parasites, drug resistant bacteria, and unsanitary water. He detailed the importance of the microorganisms that inhabit the firmament, their many jobs, and stated that sin has brought sickness to these microbes. We see the effects now – from drought to extreme rainfall. Reading from Isayah 43, Pastor reminded everyone it is Yahweh Who guides and protects the Witness, Yisrayl. Who are those who call with His Name? Pastor stated they are those who depart from sin (they repent/convert) and Yahweh is gathering them to be His People. He reminded us that Satan will not be able to stop Yahweh’s Plan for mankind. Even before Satan came up with her schemes, Yahweh knew and He prepared a place, the Protected Place. Pastor wanted us to know – Yahweh’s Plan will succeed! Yahweh’s House is established and here to stay; just like the Book of Yahweh is back and here to stay. It is a fact: The House of Yahweh has been established in the Last Days, meaning that it is fully supported by the government of the land. Pastor wrapped up his sermon with some very encouraging words about the soon coming Kingdom of Yahweh – blessed are those who keep His Laws, that they may have right to the Tree of Life, and may enter in through the gates into the Kingdom – the Promised Land.